Lucy C Burton Flowers is a freelance florist, specifying in workshops ranging from Hand-tied Bouquets to weddings. Based in London. WORKSHOP TIME AT THE PEARL! Another workshop filled with fun, interesting people and beautiful flowers. 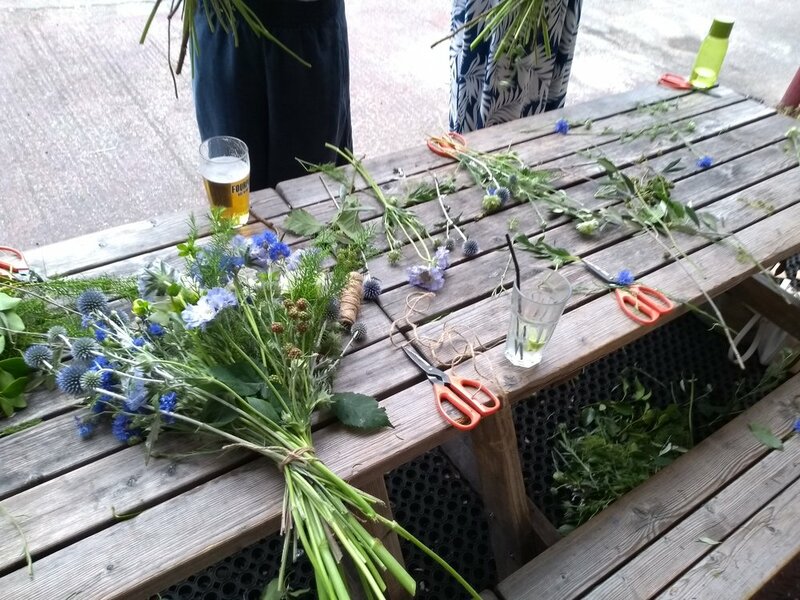 London's heatwave was in full swing, so Alex at The Pearl suggested I do the workshop outside on his benches... unfortunately the weather took a turn for the worst in terms of wind! Two vases smashed, and there was a scramble to save the flowers. The Pearl team as ever came to my rescue and moved the tables under next doors covered area. The guests arrived, grabbed some drinks and we began, making seasonal beautiful creations with the flowers that I'd purchased at Covent Garden Flower Market that morning at 4:30 am. One thing I always tell people when they ask me how early the mornings are at the flower market I say - 'Floristry is hard work, early mornings, cold temperatures, lots of heavy lifting, but.. you get to work with crazy beautiful flowers that are constantly changing their forms and textures. Work with great people and in some amazing venues Chelsea Physic Garden being one of them, In my next blog post I will be writing about my recent visit there, stay tuned.